Recorded live to tape at Queensland’s incredible Mount Nebo the end result is a record that does well to capture the Bloodletter's uncompromising presence - a merging of dark hooks with driving melody. 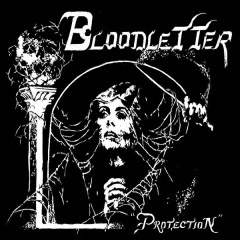 ‘Protection’ sees the group expand their sound beyond initial horizons to a more realized balance of thick atmosphere and biting melodies; a dark and melodic sound with unshaken resolve. Released on Vinyl through Nopatience Records, August 2018. 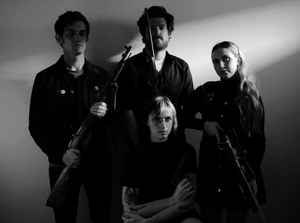 "Now a duo-state band (members are split between Victoria and Queensland), their second offering Protection continues on this path, crystallising in a dark, blistering mix that references early post-punk, new wave and 77′-era frenetic US punk akin to the Wipers. Scenes of mysticism and damnation (aural or otherwise) flit through the record: singer Lena Molnar’s voice is drenched with a sense of sorrow yet laced with hopefulness; guitar lines by Ryan Cooper and Jasmine Dunn play on and off each other, panicky and brooding; the rhythm section’s strong presence carries the sound throughout, with Cat Maddin on bass and Will Learmonth on drums." - Cher Tan, Difficult Fun.